The Celebes Sea is a sea of the western Pacific Ocean. It is bordered on the north by the Sulu Archipelago and Sulu Sea and Mindanao Island of the Philippines. It is bordered on the east by the Sangihe Islands chain, on the south by Sulawesi, and on the west by Kalimantan in Indonesia. It is 420 miles (675 km) north-south by 520 miles (837 km) east-west. It has a total surface area of 110,000 square miles (280,000 km2). The maximum depth is 20,300 feet (6,200 m). The sea opens southwest through the Makassar Strait into the Java Sea. The Celebes Sea is home to a wide variety of fish and aquatic creatures. The tropical setting and warm clear waters give it about 580 of the world's 793 species of reef-building corals. There is a large amount of marine life, including whales and dolphins, sea turtles, manta rays, eagle rays, barracuda, marlin and other reef and pelagic species. Tuna and yellowfin tuna are also abundant. 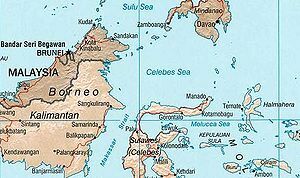 The Celebes Sea is known for its pirates. 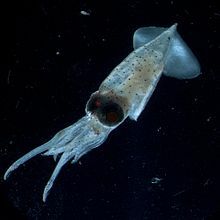 They prey not only on small time fishermen but also giant container ships. Nowadays, these pirates have high-tech weapons and equipment like radar and GPS navigation devices and ride on high-speed motorboats. It is the second most pirated body of water after the Gulf of Aden near Somalia. The Celebes Sea is an important sea route for regional trade. The sea is also popular for scuba diving and luxury ocean cruising. This page was last changed on 17 January 2014, at 19:41.